Editor: Our friends at the East County Magazine have compiled a list of red-light equipped cameras at San Diego County intersections. Here’s that list below (we rearranged it somewhat to emphasize the City of San Diego first). Getting a ticket for running a red-light equipped with camera can be a costly mistake, with fines that can run hundreds of dollars in some areas. 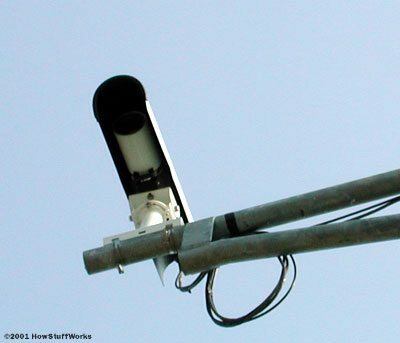 Fortunately, ECM reader Jan Hedlun has compiled a list of locations for all red-light cameras in San Diego County–including East County, North County, and other communities in our region. Editor: We’ve been informed by a commenter that there are no signs of “photo enforcement” at this intersection. Since Vehicle Code (Section 21455.5(a)(1)) says that warning signs must be posted at each camera-equipped intersection and “visible to traffic approaching from all directions,” or at all the main entrances to town “including, at a minimum, freeways, bridges, and state highway routes,” there may not be a camera located in this intersection, or if there is a camera present and you received a ticket it may be contestable in court. Nice to know. Thanks Rag. Now if I can just memorize the list. Intersection of Melrose and Hacienda Dr.
Intersection of E. Vista Way and Santa Fe. I’m suprised there’s not one in OB yet. Last I looked, the City is still planning on placing a camera at the end of the OB Pier. Fine of just over $400, non-negotiable, and traffic school. 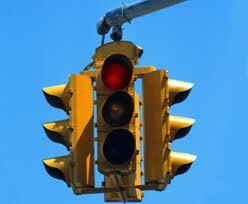 Of course most of the fine money goes to the company that operates the red light cameras and not the city……. you run a red light, you deserve what you get…….i don’t care if the city gets none of the money, if one person is spared injury by an idiot on his cell phone or in a hurry, it’s worth it……. antee: Cuyamaca and Mission Gorge Road???? Where is the traffic sign “photo enforcement”? I think I ran over the red light yesterday May 14th, 2011. I check this website today and i think i should get my case dismissed because there was no sign showing “photo enforcment” or its missing. I’m just worried and angry right now. I don’t deserve it and there should always be a traffic sign for drivers on the road to be aware of it at all cost. It’s ridiculous to receive a ticket in the mail of not knowing there was a red light camera planted, seriously because i remember clearly there was no traffic sign “no photo enforcement” posted 300 yards or on traffic light. Let us know if you go back by there and there is no sign. checked back again at night in Santee. went on by foot and drive by throughly. no signs of “photo enforcement” on that intersection. Cruised today in daylight and no traffic signs of photo enforcement on any of the following intersections in Otay, Chula Vista. Unless they’re underway to posting them. Those are just survelliance cameras monitoring the road and won’t do any effect. It’s illegal to not have those traffic signs posted unless missing. Does anyone have any documentation showing which company operates these cameras for the city of El Cajon? Received a “photo ticket” but my car was clearly in the intersection according to the first photo and the 2nd photo shows my car a few feet further in the intersection. Seems they are just trying to see if i will pay it. Are there any photo enforced signals on Bernardo Center Drive? I dont see it in the list but I think I saw camera flash when I crossed the itersection of Bernardo Center Dr and Cloudcrest Dr. I shoud have stopped after seeing the yellow light but in any case does anyone know if the signal is photo enforced?